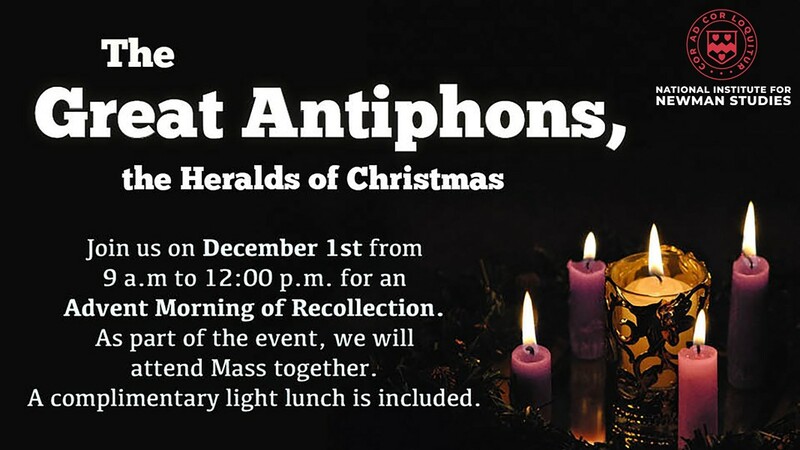 Join us on Saturday December 1, 2018, from 9 a.m. to 12 p.m., as we reflect on the great O Antiphons of Advent through the lens of Blessed John Henry Newman’s spiritual writings. The popular hymn, “O Come O Come Emmanuel,” incorporates the O Antiphons into the verses of the hymn and is sung abundantly in Christian Churches during the season of Advent. Utilizing the O Antiphons, as well as their tradition in Christian hymnody, Elizabeth Farnsworth will lead an excursion through the O Antiphons, incorporating texts from Newman as a spiritual reflection on this ancient tradition.